For a period of one (1) year from date of purchase, SFA Companies will repair or replace, at its option, without charge, any of its products which fails due to a defect in material or workmanship, or which fails to conform to any implied warranty not excluded hereby. John Deere's plug aerators penetrate the lawn removing up to 3 in. plugs of soil allowing water, seed and nutrients to reach the lawn's root system for a thicker, richer, healthier lawn. Weights are added to the fully enclosed tray to let you increase penetration depth. 500 lb. Premium Lawn Mower Lift The Pro-Lift T-5500 Lawn Mower Lift will help keep you ahead of the game with your routine lawn mower maintenance like belt replacement, blade sharpening, and debris removal in a safe and timely manner. 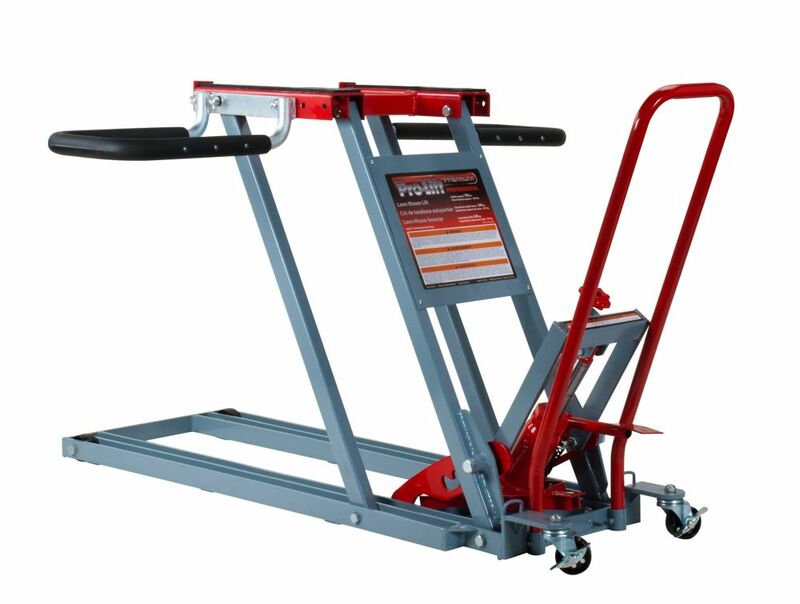 The 6 ton hydraulic bottle jack ensures a front axle saddle lift capacity of 750 lbs. and wheel bracket lift capacity of 500. The wheel stirrups are adjustable from an inside bracket width of 20 in. to an outside width of 59 in. accommodating most garden tractor and Zero-Turn mowers in the market. The design of the T-5500 is raised by the operation of an effortless and convenient foot pump to 27 in. high, providing plenty of room to safely and freely access the mower undercarriage. While under the load, the added safety features are working for you with the professional premium grade 6 ton bottle jack and the automatic mechanical locking mechanisms that makes the T-5500 double as a safe maintenance stand as well. 500 lb. Premium Lawn Mower Lift is rated 4.4 out of 5 by 20. Rated 2 out of 5 by azaircooledengine from this is a heavy duty unit. the frame is well built . the bottle jack is the weak link. ours start... this is a heavy duty unit. the frame is well built . the bottle jack is the weak link. ours started leaking after 2 months. tried leak stop, but did not help. great strong frame but they went cheap on bottle jack. you just can't put any jack in it's place. the foot of the jack is drilled to bolt to frame, the neck is also made with a hole to hook up to the lift. not any bottle jack will work as replacement. Rated 5 out of 5 by Bill from The lift arrived several days earlier than promised. I have a Skagg Cheetah with a 61 inch deck ... The lift arrived several days earlier than promised. I have a Skagg Cheetah with a 61 inch deck that weighs in at about 1400 lbs. Works great for me to pressure wash the under side of the deck. One needs a little storage space when not in use. Rated 5 out of 5 by Jedareno from What an awesome lawn mower lift! I had my worries about ordering a lawn mower lift that cost this much, but after much research, I went with the Pro-lift 500 lb lift. BTW HOME DEPOT IS $200.00 CHEAPER THAN ANYONE ELSE SO QUIT LOOKING FOR A BETTER PRICE! I now know why it cost so much. This thing is made of HEAVY DUTY STEEL. It took two delivery drivers to scoot it into the back of my Silverado and when I got home I had to take it out of the box in pieces, then slide the main body down to the ground gently. Assembly was a breeze. I left the lock washers OFF in favor of using red thread locker as my experience in the automotive industry tells me lock washers are junk. It also gave each bolt 1/4 inch more thread room to have an extra "bite" when tightening. Using the lift is a BREEZE and MAN DOES IT MAKE CLEANING THE MOWER EASY! I would highly recommend this lift. It is rather large, but all the other whiners that were reviewing this thing need to be quiet! I WANT THE PRODUCT THAT IS HOLDING MY MOWER OVER TOP MY HEAD TO BE BIG, STRONG AND RELIABLE! IF YOU WANT A MICKEY MOUSE TOY, GO GET A $100.00 LIFT! Rated 5 out of 5 by Jeffie from Fantastic This lift is easy to move around & is very stable. I use it to do maintenance on a zero turn lawnmower & it works great. I have looked at other brands of lifts & I am glad I got the Pro Lift. Some reviews said it was difficult to store, but I find that it is easy to remove the handle & stand it up against the wall with a safety hook to keep it in place. I think this a great product ! Rated 5 out of 5 by James from Fantastic lift Very easy to assemble. Much more heavy duty than I thought it would be. Very heavy, your not going to lean this up against a wall.